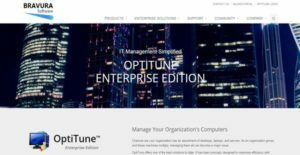 OptiTune is an elegant and easy-to-use IT management software built to give users the capability to efficiently manage multiple computers, laptops, applications, and servers as their organization expands and their business grows. The software is among the software utility tools offered by Bravura Software, a privately held software company based in Washington, USA that has been building high-quality and innovative software products for companies and businesses across the world. OptiTune helps IT departments and teams painlessly tackle the difficult issues that confront them, and at the same time giving them a productive and enjoyable experience. Designed to increase efficiency and streamline IT management operations, OptiTune ensures that users are able to have full control of all the computers and machines within their organization. This includes the ability to conduct a complete inventory of all their computers, track the performance of each computer, deploy applications, install the most current updates, and identify malware infestations. Last but not least, OptiTune can run on the cloud-based servers provided by Bravura Software, or any cloud services preferred by users. They can also use their own hardware to run the software. Managing computers from anywhere is one of the reliable features offered by OptiTune. Because the software can run in the cloud, users will be able to access the software from any location and any device. All they need to do is to connect their device to the Internet, whether it is an iPad, iPhone, Blackberry, or Mac computer. Additionally, they can manage their computers even if they don’t belong on the same network. With OptiTune, IT teams can manage and support computers remotely. Through the aid of its features called Remote Assistance Solution and Remote Connect, they can access and control the computers of end users wherever they are and even if the end users are not in front of their computers. These features enable them to easily connect to any computer within their organization and directly access files on the remote computer. Patch management is another powerful capability present in OptiTune. OptiTune automatically identifies the computers that need to be updated, delivers information about the updates installed on computers through detailed graphs and breakdowns, and generates a list of new available updates. By setting update filters, users will be able to configure the software so that it automatically approves new updates and selects the most relevant ones. With such capability, they no longer need to manually go through a long list of available updates, thereby streamlining their patch management tasks. With OptiTune, deploying applications to computers is a breeze. This is because users can quickly and easily install applications on computers remotely based on the schedules they set. As a result, mobile employees, who don’t usually visit their office, can instantly have the applications they need. Although the software supports the Windows Installer (MSI) which is needed for repackaging applications for custom installations, it doesn’t require such installer when deploying applications. Thus, users no longer need to invest in expensive custom installation and application repackaging programs. OptiTune has a monitoring and alerting functionality that allows users to immediately get notifications when security incidents happen or when something is wrong in their IT environment. These notifications can be sent through email or text. Thus, when there is a malware attack or a server is down, they will be instantly notified. In addition, they can create custom events as well as choose the events they want to get notifications for. For organizations that have multiple IT work shifts, the software allows them to create groups of administrators for each work shift and schedule when such groups should receive notifications. OptiTune also delivers endpoint security feature. With this feature, users can quickly identify the computers or applications that are infected by malware. They will be able to contain such malware infestation as soon as the software detects it so that it won’t spread over their entire network. The software permits the scheduling of quick and full scans. What’s great about this is that it integrates with popular anti-virus programs, giving users the ability to access the most up to date data on malware infections and helping them secure their computers better. Summing it up, the IT management software makes sure that users are able to monitor the performance of all computers and servers on their network. Through the aid of graphs and charts, OptiTune generates detailed performance information such as the specific times when servers show high CPU usage and disk activity, the number of processes occurring over a period of time, and the computers that need more RAM. Users can also combine performance information and data to track the performance of a group of computers. If you are interested in OptiTune it could also be a good idea to analyze other subcategories of Best IT Asset Management Software listed in our database of SaaS software reviews. There are well-liked and widely used systems in each software category. But are they essentially the best fit for your organization’s unique requirements? A trendy software solution may have thousands of users, but does it present what you need? For this reason, do not blindly invest in popular systems. Read at least a few OptiTune reviews and think about the aspects that you desire in the software such as the fees, main features, available integrations etc. Then, shortlist a few solutions that fit your needs. Try out the free trials of these products, read online opinions, get explanations from the vendor, and do your investigation thoroughly. This exhaustive homework is sure to aid you find the most excellent software solution for your firm’s specific wants. How Much Does OptiTune Cost? Free, USA based technical support available over phone or email. There are no per incident charges for technical support. Free use of the OptiTune cloud-based servers at https://manage.opti-tune.com which are maintained by Bravura Software. We realize that when you make a decision to buy IT Asset Management Software it’s important not only to see how experts evaluate it in their reviews, but also to find out if the real people and companies that buy it are actually satisfied with the product. That’s why we’ve created our behavior-based Customer Satisfaction Algorithm™ that gathers customer reviews, comments and OptiTune reviews across a wide range of social media sites. The data is then presented in an easy to digest form showing how many people had positive and negative experience with OptiTune. With that information at hand you should be equipped to make an informed buying decision that you won’t regret. What are OptiTune pricing details? What integrations are available for OptiTune? OptinTune supports integration with popular anti-virus applications. In addition, its application deployment capabilities can be extended to custom installation programs. If you need more information about OptiTune or you simply have a question let us know what you need and we’ll forward your request directly to the vendor.